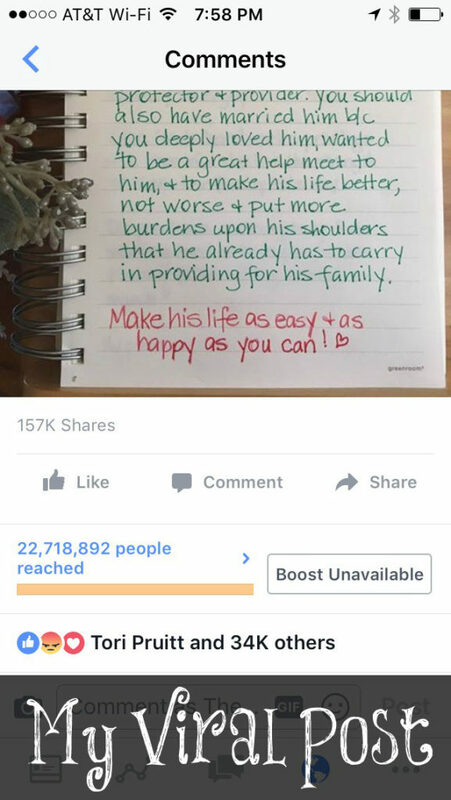 This is a repost from a year ago when a post of mine went viral! Yes, I had a post go viral. It didn’t go viral because the women loved what I said in the post. It was because they hated it and it made them angry. One woman even told me to remove it since it was so evil. What was this evil post? It’s just evil, isn’t it? Just sixty years ago, I could write this same post and it would be received as normal living for women. The majority of women had as many children as the Lord blessed them with and were full-time homemakers. Their husbands were the ones working hard outside of the home providing a living. The women were working hard inside of the home for the family. They all knew their place in the family. Women depended upon their husbands to support them and men depended upon their wives to bear children and take care of the family. My mom only completed high school. She was a full-time mother as well as most of her friends. They all married around 20 or 21 years old and stayed married until death did they part. All of her friends were full-time mothers. Children were cared for by their mothers full-time. Dads worked hard to provide. No one thought anything about it. It was just the way it was and always had been. Who changed this? Was it from the Lord that caused women to leave their homes in pursuit of higher education and careers thus leaving their homes and children in a mass exodus or the enemy of their souls? The introduction of birth control was just as evil. “The most serious evil of our times is that of encouraging the bringing into the world of large families. The most immoral practice of the day is breeding too many children,” she wrote.“The most merciful thing that the large family does to one of its infant members is to kill it.” (Margaret Sanger). So my question to you, Christian women, is why have you allowed Satanic inventions influence your life? This is something you will have to wrestle with. I hate birth control because of what it has caused – the long term consequences of it, namely 58 million babies slaughtered in the womb. I fault the feminist movement for all of the children being raised by strangers instead of their mothers, plus all of the divorces that have been perpetuated upon marriages, the confusion of roles in marriage, and the extreme wing that wants to see no differences between men and women. Yes, I was attacked viciously on this post and other posts close to it. No, I am not bothered by it. I have been viciously attacked since I began blogging. This should come as no surprise to any of you. The world hates God’s ways. I love His ways and will teach them to whoever will listen as long as the Lord allows me to do this. They judge me constantly; the same thing they are accusing me of doing. I have never called anyone a name, ridiculed or treated those with whom I disagree with disdain and disrespectful foul language. Many believe that America is a place of tolerance, yet far too many are now trained by the system to attack any ideas that seem to go against their worldly agenda. I am comfortable standing on the Truth as I know Who has my back and He who is in me is greater than he who is in the world. They are being blinded by the enemy of their souls. We are commanded to speak Truth in love and plant seeds where we can. This is what I do and I love doing it. I also love watching God send thousands of new readers to my blog and Facebook. What Satan intends for evil, God can use to help pull His remnant together so that together we can support each other in the ways of the Lord. Don’t feel badly for me when I get hateful comments. We have been promised in Scripture that we will be hated because He was hated. This is nothing new. Jesus spoke the most radical words at the nexus of history that exploded forth the greatest display of God’s salvation by way of the cross. They hated the creator God so much that they murdered His Son, and God turned their hate into the greatest good for mankind. Yes, pray for me and my ministry, and be an unashamed light in a world that is quickly growing dark with sin and blindness. Continue to do what the Lord has commanded you to do and store your treasures in heaven. The time is short. 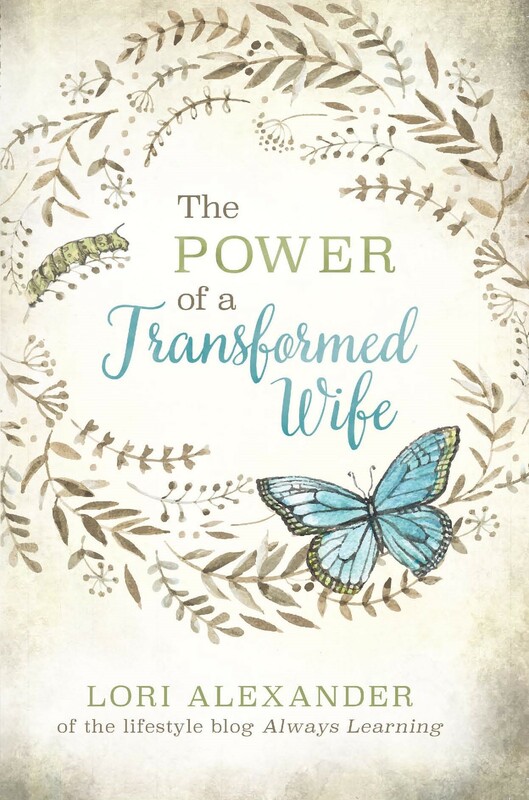 So recognize that anyone can replace you in a job, but no one can replace you as a godly wife to your husband and as a loving mother to your children. *My post was carried in two different news sources. Bravo! Blog on! Your bravery is reaping wonderful fruit amongst those who will hear your much-needed message!! What you wrote on that notebook is so true and straight from the heart of God and His plan for women. And it also defines the servant heart of God that He desires for all of his people. I’m so glad that this post went viral and I hope it gave a lot of people something to think on. Thank you, Jill! God uses our little seeds of truth to grow oak trees of righteousness. It amazes me that people were willing to be so nasty to you over nothing more than dsagreeing with what you have to say. I was taught to either say something nice or say nothing at all…it seems that lesson is getting lost lately. It most certainly is, Taylor. Many today are vulgar and mean since they want nothing to do with the Lord and His ways but have become their own gods instead. His Word is powerful and sharper than a two-edged sword and no man will be able to stop its influence, thankfully! If expectations destroy relationships, does this mean a husband should not expect a wife to cook? Im confused here. I am talking about expectations past what each spouse’s role that the Lord has clearly defined in His Word. 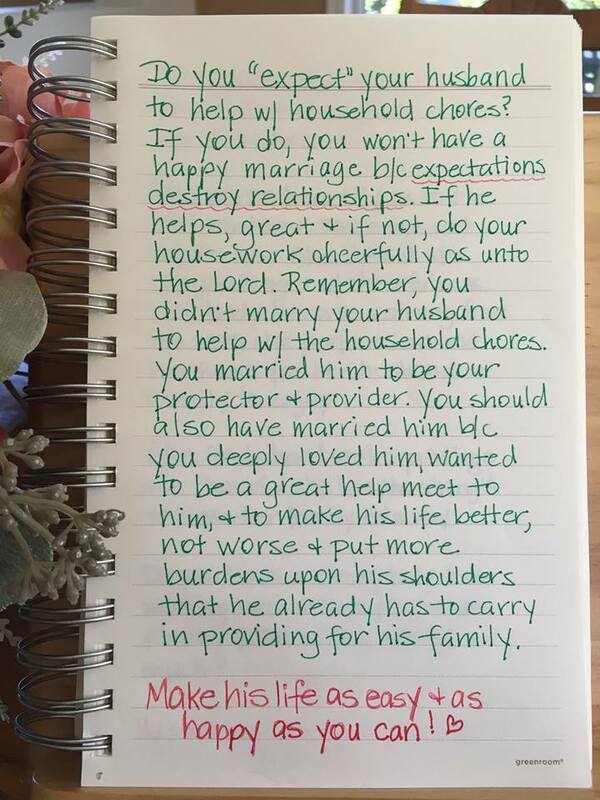 Yes, a wife should expect her husband to provide for the family and be faithful to the vows he made to her and yes, a husband should expect his wife to be a keeper at home (and all this entails) and be faithful to the vows she made to him. But putting expectations on a spouse that are not spelled out in the Word but have become expectations that our culture has put upon them is destructive to marriages. Lori! What a burden – my husband and I do not do social media so I was not aware until your blog last week and today! how awful to have your post so widely read and talked about. If only these women could taste the abundant joy that comes from serving their husbands and children. They are deceived into thinking joy is found outside God’s ways. I’ve been in both worlds. Give me Gods ways any day. I love being the one my family know will meet their needs.